"Whenever you are in danger, - whether in the middle of the ocean, or in the midst of the battlefield, or in the deepest jungle - think of me and I will deliver you to safety." Over two centuries after these words were uttered by a sage, they have become famous all over the world. Here is one sage who predicted that a century after his death, he would be greatly revered by one and all. True enough, at present, his is a household name in Bengal, India and even all over the world. Nearly every Hindu Bengali home has his idol placed in the family altar, huge temples are being built in his honor, thousands of devotees bow before him and glorify him as their Guru and Lord. He is Baba Lokenath. 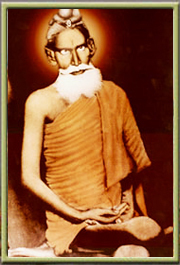 The following pages are devoted to the life and teaching of Sri Sri Baba Lokenath Brahmachari. Please click on the links to visit the pages.